It's fast and easy. Simply draw the dielines in Illustrator or import them from another box design file. Use Illustrator tools to add graphics to the structure. Open Folding Genius' 3D preview window and click Fold to see the folded design appear in three dimensions. Rotate and zoom to examine, then save as a JPG or export as a 3D PDF. Folding Genius 2 for AI is available as a subscription service for $195/year or $79.95/ quarter or $29.95/month (USD). For more information contact AlphaCorr at +1-800-862-0795 or visit AlphaCorr online. 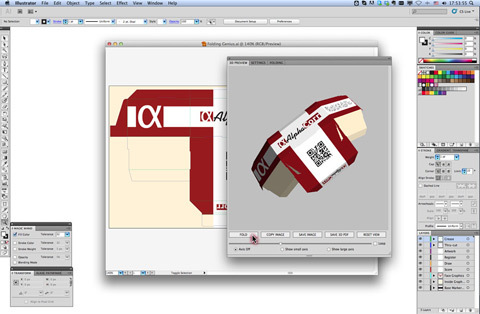 Austin, Texas - Based in Austin, Texas, AlphaCorr, LLC is the world's leading developer of structural packaging and point-of-purchase display software for both Mac and Windows. Founded in 2007, AlphaCorr uses the powerful, yet easy-to-use user-interface paradigms originally developed for Ashlar-Vellum Graphite(TM). AlphaCorr continues to enable the creative design and production of precise, sophisticated packaging and displays around the world. All Material and Software (C) Copyright 2014 AlphaCorr, LLC. All Rights Reserved. Apple, the Apple logo, Max OS X and Macintosh are registered trademarks of Apple Inc. in the U.S. and/or other countries. Other trademarks and registered trademarks may be the property of their respective owners.